Here’s a very intriguing Barrier Canyon Style pictograph that Philippe and I accidentally discovered in the San Rafael Swell last month. This is just the very top portion of the panel I’ve called The Unexpected Panel and it is very well preserved…it’s also my favorite part of this entire panel! The ‘holes’ in this figures’ hands and feet remind me of the Skeleton Shaman located at the Head of Sinbad, though this one has much longer and curved fingers. It seems to be interacting somehow with the ‘flying circles’ which might represent birds? 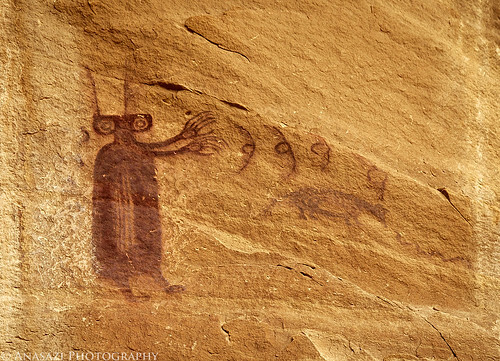 Below those ‘flying circles’ there also appears to be a dog-like zoomorph with some details painted in it’s body that are reminiscent of the Intestine Man near Moab.